How time has flown! We arrived in Dorset for Halloween last year nearly 6 months ago and frankly... we've not missed London. What we hadn’t realised when we moved here is how much our focus would shift towards planning a vegetable garden, we just love nature and being outside in the fresh air surrounded by wilderness. Old life: Typical cramped over-priced London flat! New life: Our Dorset home comes with a lake for not even half the cost! So ahead of Spring, since February (when the soil was frozen rock-hard), we’ve spent hundreds of hours fencing, digging vegetable beds and improving the soil with organic matter. In order to remain quite frugal and recycle what’s available to us we used (free) pallets to fence the veggie patch. It’s actually quite cool/quirky and gives our garden an arty feel. Our make-shift fence’s permeability was greatly improved with chicken wire to dissuade smaller critters. We’re so keen on recycling we even used an old tractor tire as a raised bed for a rhododendron and empty wine bottles in the greenhouse to edge our beds (yes we like our wine!). 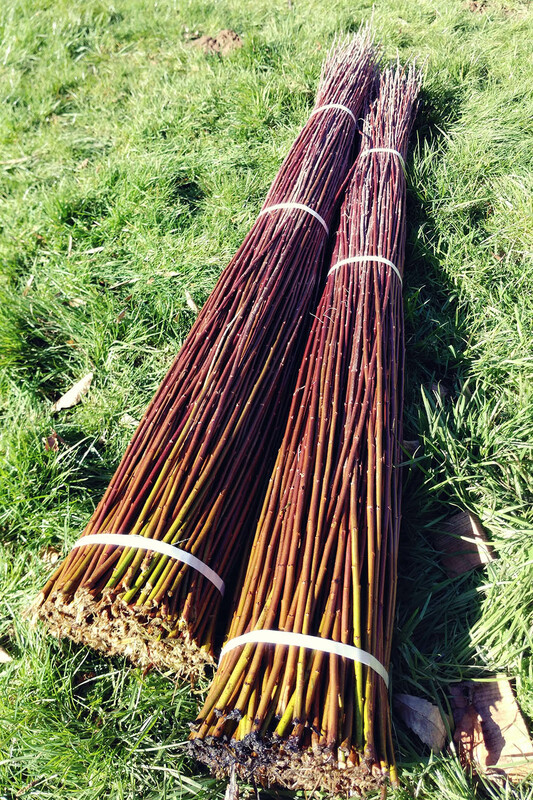 I then proceeded to plant 200 willow branches / cuttings in the wet soil, each spaced by 5 inches and around the fence. With time these will grow (they root very quickly), thicken and branch-out to create a natural fence, much prettier than my "pre-loved" pallets! I also made another great use of what’s available and used our bamboo grown in our garden to build a sturdy greenhouse. I could call it a poly tunnel as it’s covered in (re-used) plastic sheeting, being made of bamboo I just prefer to call it a GREEN house. Structural engineering but country style! This welcomed increase in temperature will benefit in particular my strawberries, chillies and tomatoes. I see it as a helping hand to produce more and yield better fruits! Not bad for a zero-cost greenhouse! Of course the best way to grow happy vegetables is to have full control on what medium they actually grow in. Why buy seeds to sow them in poor quality soil? So instead of filling our beds with cheap soil from dubious origins, we make our own rich compost from left-over food (all except animal products), grass clippings, wood ash, dead leaves... This has the added benefit, aside from providing plants with nutrient-rich soil, of recycling all of our organic kitchen waste and therefore diminishing food waste by allowing it the best use: feeding our crops. As much as we love animals who regularly visit our garden, they are not welcomed in the veggie patch. Deer, rabbits, moles, black birds, slugs… OUT OF MY GARDEN before you eat all my home-grown fruit and veg! However we always look for kind ways to dissuade them before reaching for the explosives. BOOM, you've been warned. Some of these organic pest-controls include nematodes, ladybirds, birds and many more ancient ways of dealing with the problem which were ditched by farmers for the convenience of chemicals which harm the land. You wouldn't want to harm this little guy now would you? Then comes the issue of the late arrival of spring here in the UK, even though we are as south as it gets, further south and we're swimming in the channel. Do I sow too early and see my seedlings stretch unreasonably for light to eventually die from late frosts? Do I sow late out of caution but possibly shorten the already short growing season available to my plants? A bit of a gamble and I'm not a gambler. So we made clever use of our indoor LED lights and created an indoor plant nursery. Sowing inside early while still giving seedlings a generous quantity of light helping keep plants compact and sturdy until the decision is made to transplant them outdoor when we can with some level of certainty eliminate the risk of late frost. Being a drone operator (fancy name isn’t it!?) I found a rather unusual use for my DJI Mavic Pro drone: Aerial garden planning. Aerial drone photographs of my garden are downloaded onto my iPad Pro. Combining the drawing app Sketchbook Pro and the clever Apple Pencil I was able to draft plans and sketches onto photos from the comfort of my sofa during rainy days. That worked a treat and really saved me a lot of pain going in and out to measure things in the mud. So what exactly are we going to grow in and out of the greenhouse? What was all that work for? We’re mega excited about the prospect of these developing to maturity in the next few months (provided the slugs heard my warning of using explosives on them!). Our garden (which in itself is about five times the size of our London flat) will provide us with a steady supply of fresh organic fruit, veg and herbs of reliable origin. Not a bad spot for a BBQ on a Summer's evening! I've known since I was a kid and ate many of our own fruit and veg that whatever it is you grow, it’ll always taste better than anything you can buy in supermarket. Supermarkets stock fruit and veg that is selectively bred or "engineered" (GM or cross-breeding) to last longer and look “prettier” but definitely not taste better. They are usually harvested well before maturity in order to ripen during transport and on supermarket shelves. Finally by the time you eat them, they’ve been travelling for while and have usually lost most of their vitamins and beneficial nutrients due to extended light and air exposure. Interested in plants, gardening and possibly living a new life? Follow our progress here on the blog, we’d love to have you all on-board and share with you all the recipes we’ll then be creating using our home-grown bounty! This couple I photographed in 2009, and found again eight years later, were my inspiration to be a kinder photographer. Find out all you need to know about our shepherd's hut restoration in Dorset. One of our most ambitious project to date!